The cream is pretty thick...almost paste like. It's not a bad thing, it's just a different texture. The smell is very minimal. It's a light cream smell..actually it's the scent of vitamin e. That said...I have insane, superhuman abilities to sniff stuff. It's bizzare. It contains a natural blend of elderflower, vitamin E and oil of evening primrose. The cream is hypoallergenic and it's good for 24 months after you open it. Perfect for people with skin sensitivity. 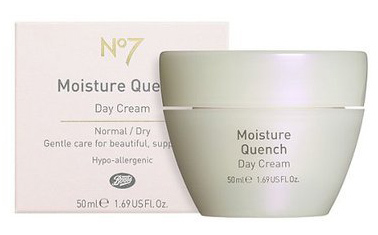 I probably wouldn't repurchase this particular cream again, however I would try other Boots No.7 products. I do also have a night cream I'll review. Stay tuned for posts on Beauty Box 5 and Glossybox sample boxes!